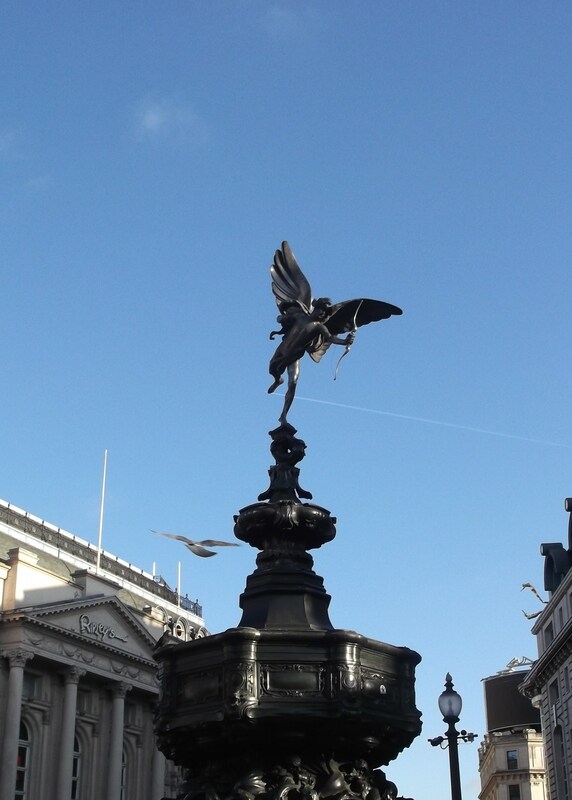 15 minutes in Piccadilly - A short walk in London - Has Anyone Been To...? This 15 minutes in Piccadilly is squarely on the tourist route, but still gets missed in the rush from Hyde Park to Covent Garden. ton that used to sit on top was removed in 1882 when the arch was moved to it’s present location, and replaced in 1912 by the enormous statue there today, which shows the angel of peace descending on a chariot of war. Before it was installed, Adrian Jones, the designer, held a party in which eight guests were seated for dinner in the hollow body of one of the horses. The arch is also hollow and open to the public, with a museum inside, and you can also get great views from the top across Hyde Park. One half is also a ventilation shaft for the Underground system, and occasionally large plumes of dust and debris rise from it. It sits alongside the memorials to the Machine Gun Corps and Royal Artillery men lost in WWI, and the two memorials for the Australian and New Zealand troops lost in both World Wars, and opposite Apsley House. The Duke of Wellington bought the house from his nearly bankrupt brother just after his victory at Waterloo. Parliament had voted to give him £700,000 to build a new palace, but he used £40,000 to buy it and bail out his brother instead. Originally the first house built inside the Hyde Park Toll Gates, this was officially “No. 1, London”. Even the subway passing from Piccadilly to Hyde Park Corner is covered in line drawings depicting the Duke’s great victories. Just off Piccadilly, on Old Park Lane, is the Rose and Crown. This pub dates back more than 400 years and was used as accommodation for Oliver Cromwell’s bodyguards. More spookily, prisoners headed for the Tyburn Gallows used to be housed overnight in the cellars here. The next left turn also reveals something of interest- the Mayfair Mini Mart. 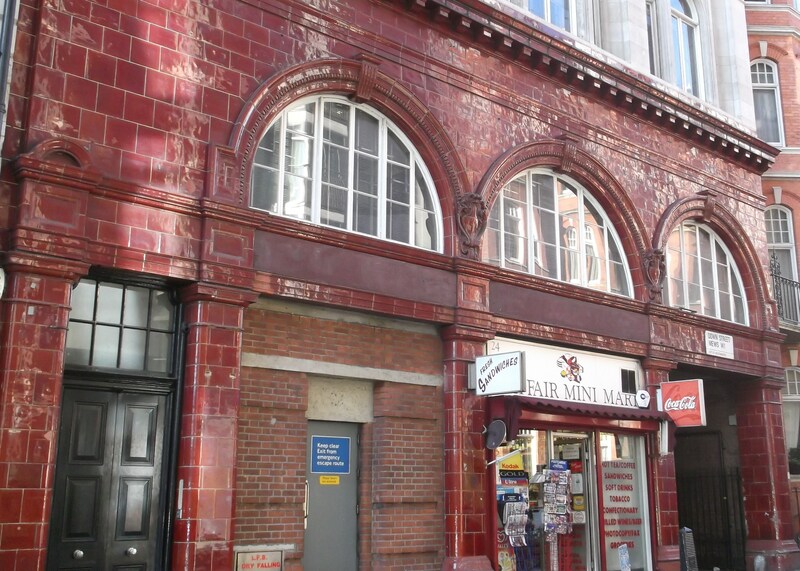 Or rather, the building it now occupies- a disused underground station. There are lot of these kicking about London, but usually only noticeable if you know, and as sudden change in pressure as you whizz through on the train. Down Street station still has it’s original and unmistakable facade though. Shut in 1932, mainly due to the close proximity of the other stations, it was used as a bunker during WWII by both rail executives and Winston Churchill and the War Cabinet. 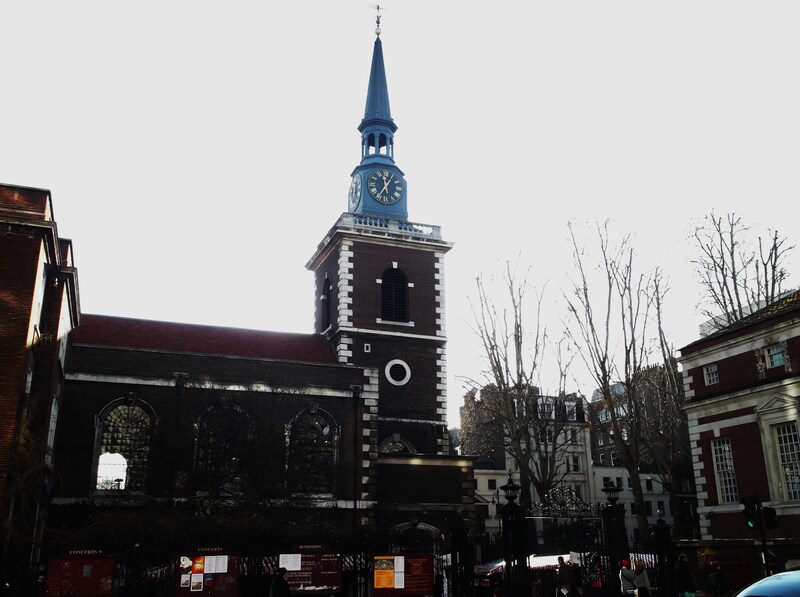 Not to be confused with the more famous Shepherd’s Bush Market, Shepherd Market is just at the end of White Horse Street, and is the site of the original 15-day May Fair that gave it’s name to the whole area of Mayfair. This grand if crumbling old building was built in the mid 1700’s and has had a host of aristocracy live there. Most famously, however, was Lord Palmerston, who acquired it in 1850 and lived there through his Prime Ministership. 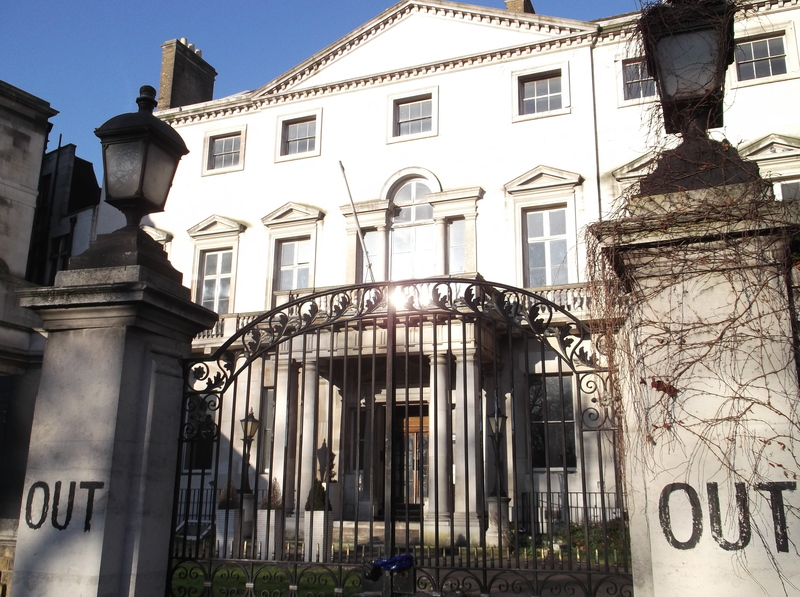 After his death, it was bought by the Naval and Military Club, which quickly became known as the ‘In and Out’ Club, thanks to the prominent signs on the front of the building. It was in this building the club first set down the rules of Bridge, which it still arbitrates today. The Club moved out in 1999 and sadly the building has been empty since. It has recently been bought by the Reuben Brothers to add to their Mayfair estate, so things may start happening with it. An unprepossessing street, but one famous for being both name and setting of a Michael Caine thriller and also home of Bertie Wooster and his Gentleman’s Gentleman Jeeves. The rather more real James Boswell, writer of ‘Life of Samuel Johnson’ also lived here. The corner of Dover Street has one of the most beautifully out-of-place statues in London. 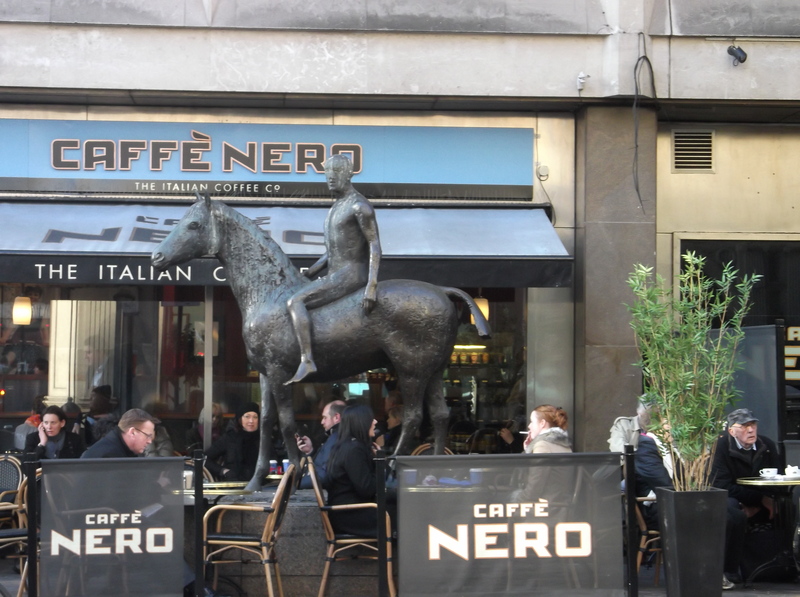 A large Elisabeth Frink bronze sculpture, Horse and Rider, sits slightly higher than ground level, surrounded by chairs and tables from the coffee shop next to it. It’s so odd to see it there, it often requires a double take. Further up Dover Street is Brown’s Hotel, which claims to have been the first Hotel in London. It was opened in 1837 by James Brown, Lord Byron’s valet, and his wife Sarah Brown, who was Byron’s personal maid. It has an astounding guest alumni, including Roosevelt, Napoleon III and Haile Selassie I as well as writers Kipling, Wilde, Arthur Conan Doyle, J.M. Barrie, Robert Louis Stevenson and Bram Stoker. Agatha Christie stayed here and her book ‘At Bertram’s Hotel’ is squarely based on Brown’s, and far more impressively, Alexander Graham Bell made the first successful telephone call from Brown’s in 1876. 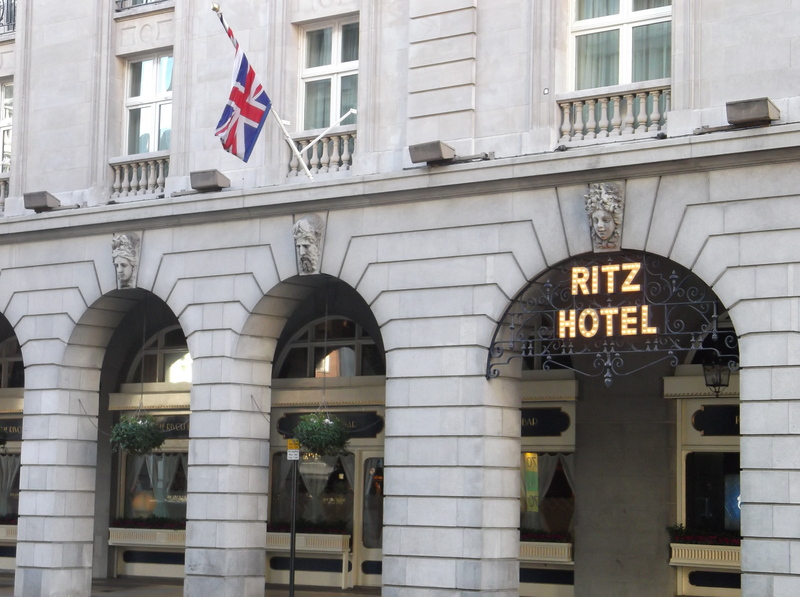 Perhaps the mot famous of all the London Hotels, with a name that has itself come to mean posh and luxurious. Named after Cesar Ritz, former manager of the Savoy, and designed to his specifications, I have to be honest here and say… I frankly think it’s looks gaudy. However, it’s kept many a person happy through the years, perhaps none more so than Oswald Mosley, who was enjoying his pre-wedding drink in the bar so much, he forgot to go to his wedding. A fellow guest’s rather pointed congratulations on having just gotten married sent him off in a rush to just get there before the bride left. In a very grand building down the far end of this street is the Royal Institute. The World’s oldest independent research body, there have been a total of 14 chemical elements discovered in this building since it’s founding in 1799. It’s other claim to fame is that the huge numbers of people attracted to a lecture by either Humphrey Davy or Samuel Coleridge (people seem unable to agree, but Davy did try out his invention laughing gas on Coleridge and Wordsworth, so maybe it was both) caused such traffic mayhem it was decided to make Albemarle Street one-way: The first one-way street in London. Unsurprisingly, Albemarle Street was also home to the Albemarle Club, a Gentleman’s Club that was seen as more bohemian and relaxed than other Gentleman’s Clubs at the time. This is where the Marques of Queensbury burst in, demanding to see Oscar Wilde, furious at Wilde’s relationship with his son. Wilde was not there, so the Marquess left a note alluding to Wilde’s homosexuality. As this was still illegal then, Wilde was compelled to take the Marquess to court for libel to clear his name, only for it to be proved and for Wilde himself to end up in prison. This street also saw one of the great publishing dynasties- John Murray Publishers. Founded in Fleet Street in 1768, John Murray hit real success with his publication of Byron’s Childe Harold in 1812. This earned him enough to move to the more salubrious location of 50 Albemarle Street, Mayfair, from where he, followed by his children, ran the publishing house until 2002. Great names published there include Jane Austen, David Livingstone, Charles Babbage, Charles Darwin, Arthur Conan Doyle and John Betjeman. John Murray III also created the very first travel guide books, in 1836, which later became the more famous Blue Guides. The name lives on now as an imprint of Hodder Hachette, but it is sadly no longer family run. Burlington ArcadeThe longest covered shopping street in the UK, this isn’t your average indoor market. This is strictly luxury. 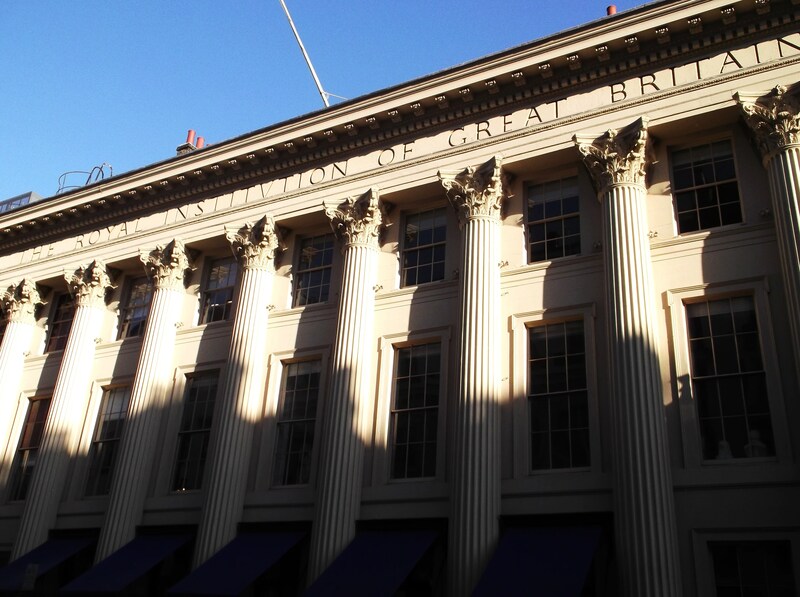 It was built in 1819 by Lord Cavendish, the owner of grandiose Burlington House next door, ostensibly “for the sale of jewellery and fancy articles of fashionable demand, for the gratification of the public and to give employment to industrious females”. However, rumours abound it also had much to do with a desire to stop people being able to throw rubbish into his garden at Burlington House. 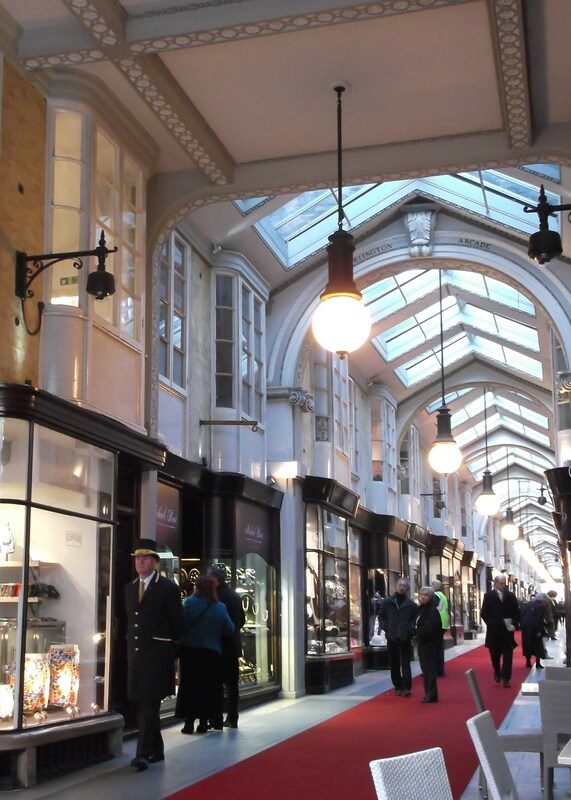 The arcade was the scene of a daring, film-esque daylight robbery in 1964, when a Jaguar Mark X drove into the arcade, and six masked men broke the windows and raided the Goldsmiths and Silversmiths Association shop for £35,000 worth of jewellery. The culprits were never caught. Hancocks jewellers, who were one of the original tenants and are still there today, designed and have created all of the Victoria Cross Medals. As stated previously, this was originally an enormous mansion house, but bought by the Government in 1854. They intended to demolish the house and use it as the site for the University of London. Public opposition put paid to those plans and in 1857, The Royal Society, The Linnean Society and the Royal Society of Chemistry moved in. The Royal Academy of Arts took over the main part of the building in 1867, with a 999 year lease, at £1 a year rent. It is still home the Royal Academy, and also 5 learned societies- the previously mentioned Royal Society of Chemistry and the Linnean Society, where Darwin and Wallace first presented the Theory of Evolution, as well as the Geological Society of London, Society of Antiquaries of London and the Royal Astronomical Society. The courtyard is free to enter and open to the public, and the Royal Academy often has exhibitions on. The other societies are a little less public, but open for lectures and shows on certain days. Founded in 1707 by William Fortnum and his landlord Hugh Mason, this is officially the Queen’s grocers. If you’ve ever felt that your local supermarket was lacking in chandeliers, this is the place for you. When Queen Victoria heard Florence Nightingale’s reports of how poor conditions were in the hospitals during the Crimean War, she ordered Fortnum & Mason to keep her supplied with Beef Tea. They have bee hives on their roof for their own honey, and the clock on the front of the shop has figures of Fortnum & Mason who come out and bow to each other on the hour. 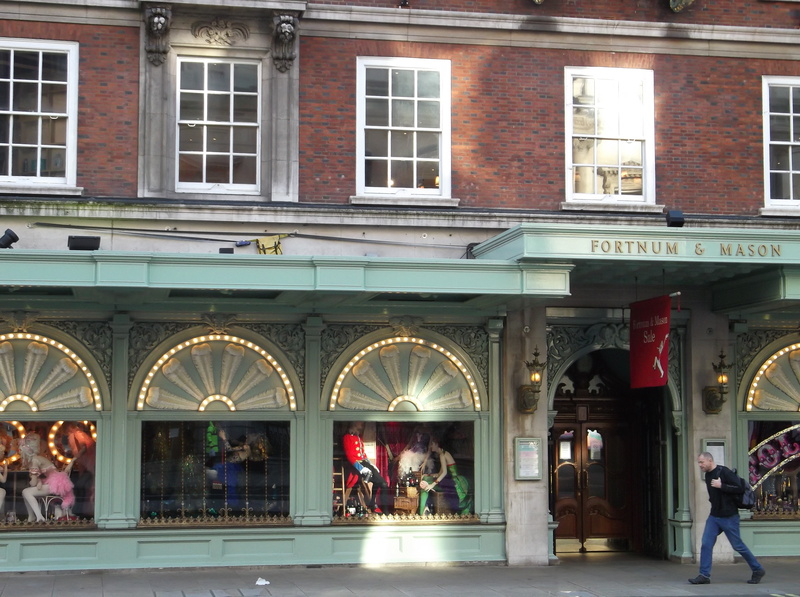 Next door to Fortnum & Mason is the oldest bookshop in London, founded in 1797. Mr Hatchard, whose portrait still hangs on the stairs, was a member of a secret anti-slavery movement, and let William Wilberforce hold abolitionist meetings in the reading room in the back. Other distinguished guests include Byron, Thackeray, Wilde, Disraeli, Kipling and Maugham. One of the reasons so many names seem to keep popping up around Piccadilly is thanks to this unremarkable looking apartment building. Built in 1770 as one house, it was converted in 1802 into 62 bachelor apartments. They attracted a whole host of celebrated names- Byron (who received visits from Caroline Lamb disguised as pageboy), Graham Greene, Aldous Huxley, J B Priestley, as well as future Prime Ministers Palmerston, Gladstone and Heath. Women are now permitted to reside at the property as long as it is with their husbands. Yet another of Christopher Wren’s holy contributions to the City. This one however, is a little different, as it is the only one built on Virgin ground, and it is also reputed to be Wren’s personal favourite. The famous caricaturist James Gillray is buried in the courtyard. Two famous bookshops so close to one another is unusual, but that they could be so different is also impressive. This Waterstone’s occupies the building that used to house Simpsons department store, said to be the inspiration behind ‘Are You Being Served?’. While Hatchards is old and rambling, this building is a modern behemoth, and holds the title of largest bookshop in Europe. ErosWho says that Londoners can’t be romantic? This famous statue of Eros, the ancient Greek God of Love, is in fact supposed to represent the Anteros, his twin brother, the God of Requited Love. Due to the fuss that was kicked up about a public statue wearing no clothes and representing such sensual things, it was renamed the Christian Angel of Charity, a pretty close approximation to Anteros role in Greek Society. He was a memorial statue to Lord Shaftesbury’s philanthropy. As soon as people saw him though, being all half-dressed and wielding a bow and arrow, they nicknamed him Eros, and the name has stuck. It even crops up on official maps and signs. It was the first public statue in the world to be made from aluminium, and to protect it from bombs it was removed during WWII. When it was replaced, it was facing the other way. Officials claim that this was deliberate so that now he points to Lord Shaftesbury’s home seat in Dorset, but most people suspect a mistake. Neat section on Waterstone’s/Simpsons-the inspiration for AYBS.